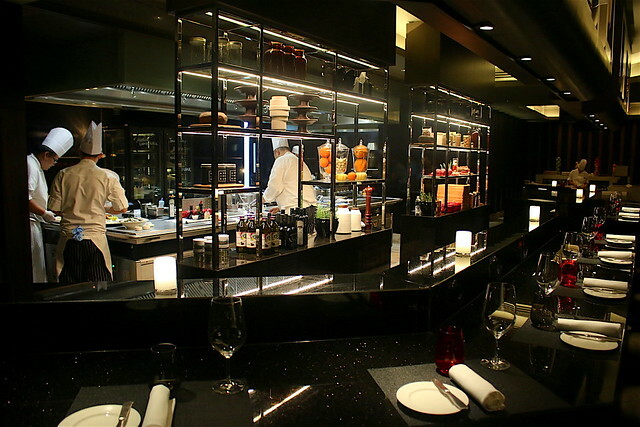 The open kitchen area reminds me of L'Atelier de Joël Robuchon. I do love that sleek contemporary look with the polished steel and pops of colour accenting the black. 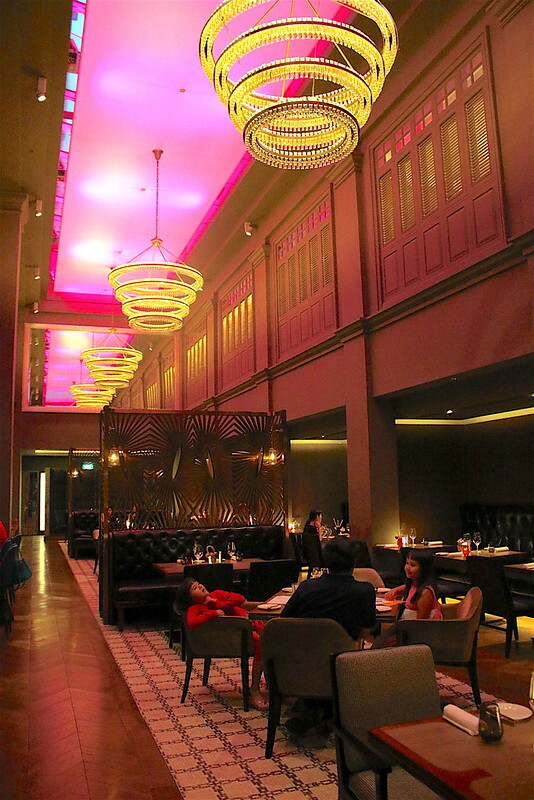 The main dining area has a skylight canopy that lets in gorgeous natural light by day but transforms into a stylish colour changing space in the night. Pendant lights comprising hand-cut polished crystals helps set the mood. The slim line design of the chandeliers help anchor the double height space. Stunning looks aside, the food has also gotten a massive upgrade. And that's the best news. Here's a look at some of the dinner items. This was some of the best steak we've had in a while, and I'm surprised it came from a hotel instead of a steakhouse. Ash & Elm uses Manuka wood chips alongside charcoal in the grill for robust aromas. We liked the striploin a lot surprisingly. The French Bave e d'Aloyau had the most gamey but complex flavour. This is a seriously must-try platter. 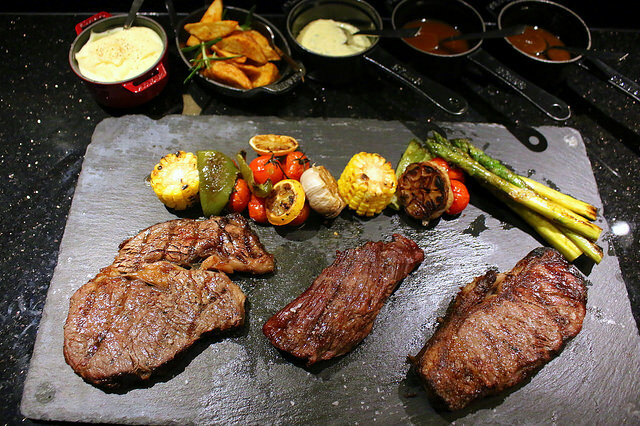 Choose from Bearnaise sauce, Peppercorn sauce or Natural Jus to complement the steaks (honestly, the meat was so good, they didn't need any). 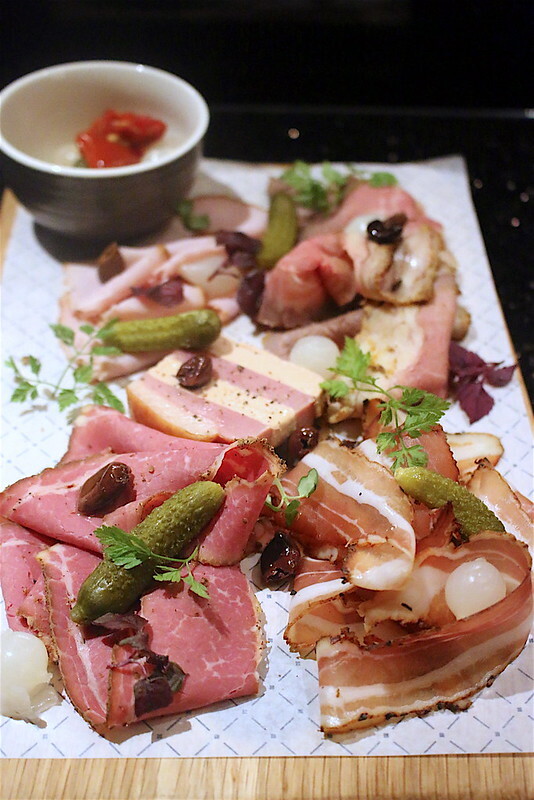 The signature platter has charcuterie favourites all on one platter. There are also French, Italian and Spanish themed platters each featuring the meats and cold cuts from the respective countries. 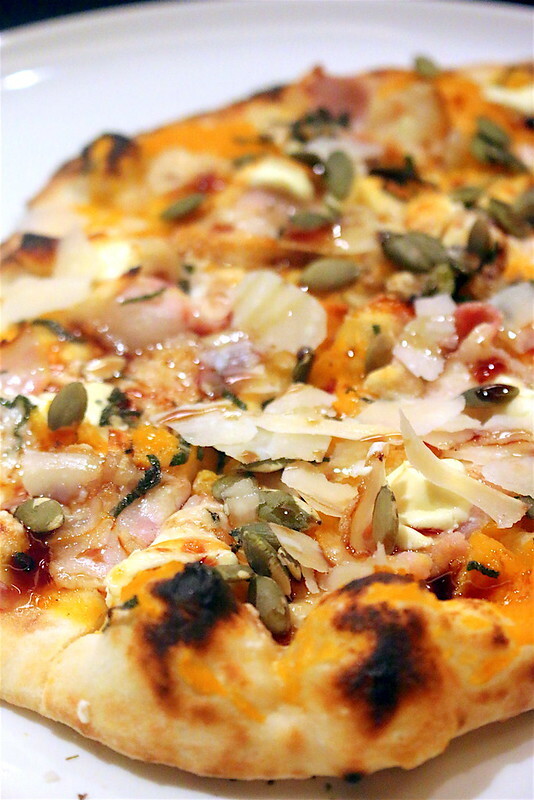 The wood-fired oven churns out the most delightful flat breads. I liked the light, chewy and fluffy bread base, almost more than the toppings (maybe pumpkin is too bland for me). Next time I will try the Prosciutto and Arugula (S$26), or the Chorizo and Olives (S$24). There's also a Vegetarian one (S$22). 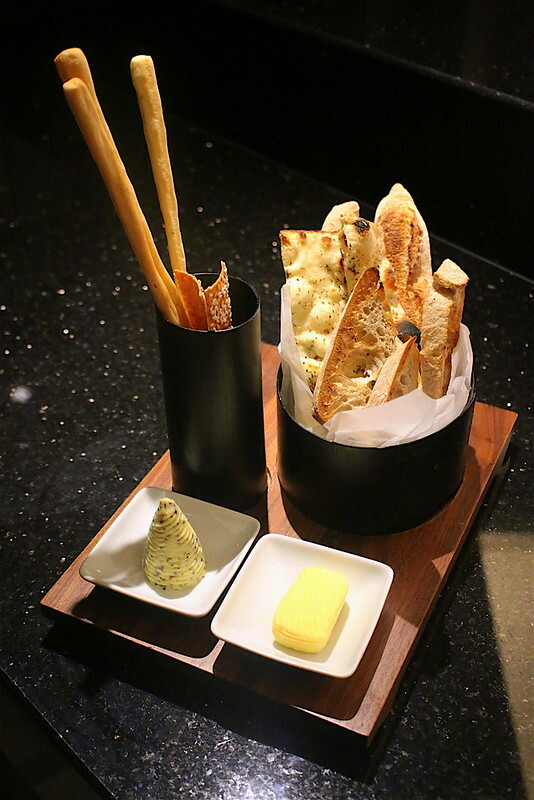 Having such an oven means your starter breads are also more interesting. 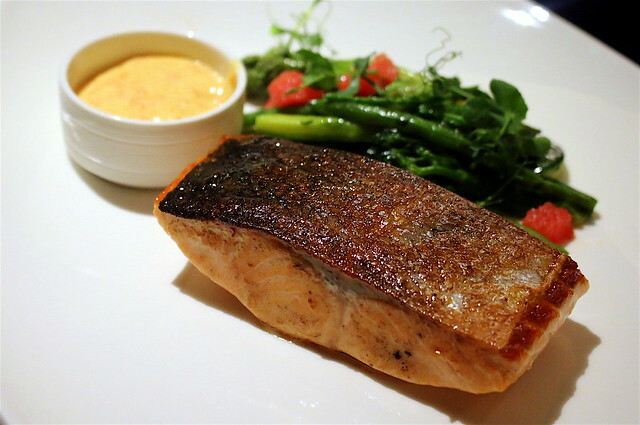 Other goodies from the wood-fired oven include Gratinated Lasagna Bolognese, (S$25) Whole Seabass "Au Plat" (S$49), and a whole Boston Lobster Thermidor (S$78). Also from the charcoal grill is this beauty. 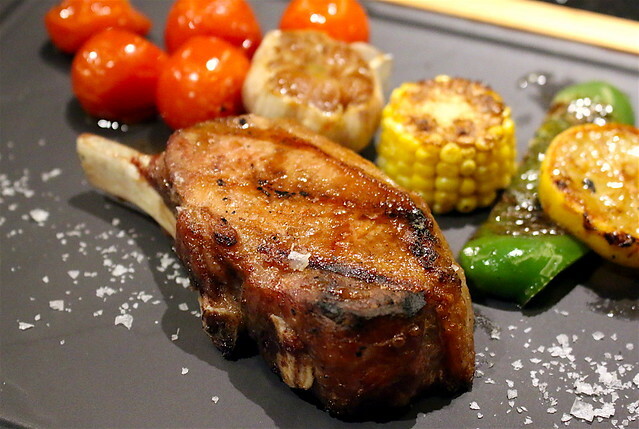 A hefty pork chop with a medley of lusciously grilled vegetables. By this stage, we were a little too full to fully appreciate this but it was definitely a dish well-executed. 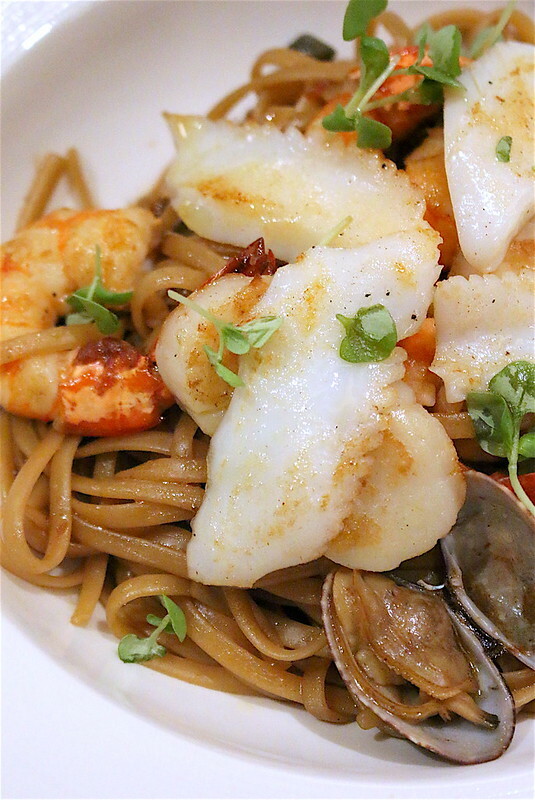 Such generous seafood in this plating. This pasta almost tasted Chinese, like it had some soy seasoning. Maybe the thick crustacean sauce was just extra umami. 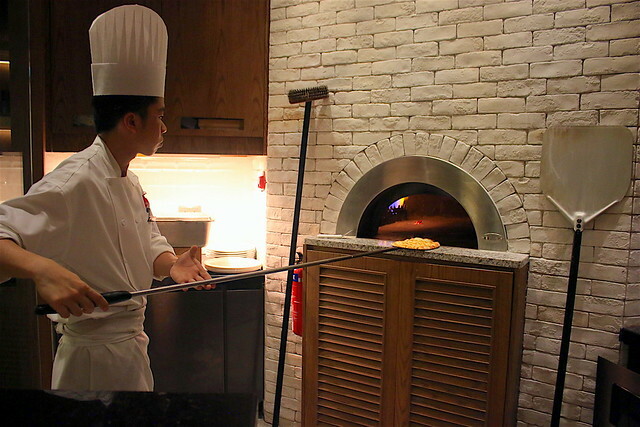 Remember the wood-fired oven? Yeah, it does dessert too! 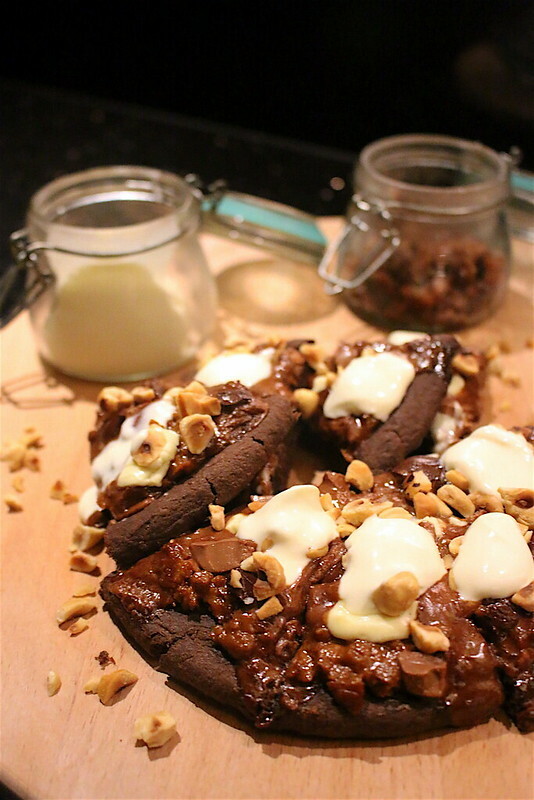 I think chocolate fans will think they have died and gone to heaven. If they make a salted caramel version, I think I will float to heaven myself. Other desserts are more ordinary - fruits, ice cream, sorbet, apple tatin, peach melba and Salty Chocolate Rum Raisin. I am curious about the Yuzu-Citrus Combination though - Lemon Sablé Breton, Yuzu Curd, Mandarin Orange Reduction and Yuzu Sorbet. Must come back. So that's Ash & Elm at the InterContinental Singapore. Despite the complete overhaul, prices are pretty reasonable. Again, the steak is the highlight and reason enough to return. They have a semi-buffet lunch available Mondays to Fridays, and have just introduced Sunday brunch. I hope to cover those in time to come, so watch this space.